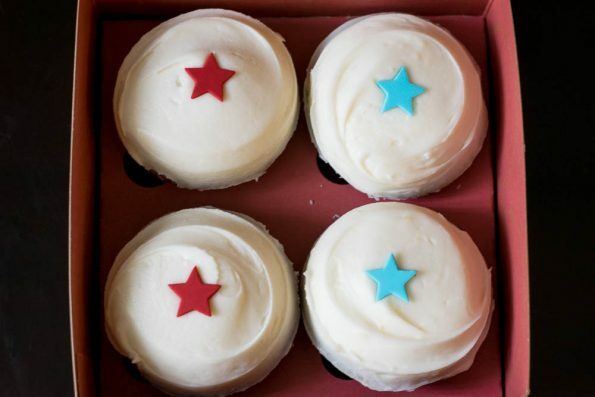 From June 27th through July 17th, Sprinkles Cupcakes is offering their patriotic cupcake pairing, the 4th of July Box! Capped with patriotic stars, these Lemon Blueberry and classic Red Velvet cupcakes can be configured into a sweet star-spangled banner. 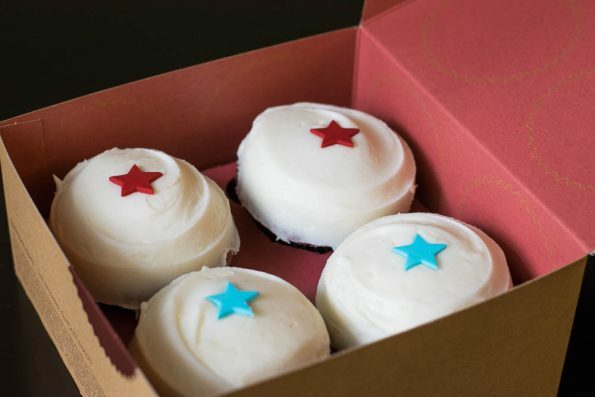 With these classically American cupcakes, you’ll want to pledge your allegiance to Sprinkles Cupcakes! They even come sealed with a 4th Fireworks and Cupcakes sticker. We recently got to try the 4th of July Box. We decided to invite some friends over (always looking for an excuse to host people), cook dinner, and have the cupcakes for dessert. Now to be fair, we’ve had Sprinkles Cupcakes in the past, but had yet to try these flavors. We typically stick with Vanilla, Strawberry, and/or some variation of chocolate. Each couple (there were 2 couples) shared 1 of each type of cupcake. While both cupcakes were enjoyed by all, the girls preferred the Lemon Blueberry cupcakes and the guys preferred the Red Velvet. Both cupcakes were light and fluffy and the frosting was incredible! We noted that the nice thing about Sprinkles’ Red Velvet cupcake was that you could actually taste the chocolate in it versus just a sweet cakey flavored cupcake. The frosting on the Lemon Blueberry was so good that we almost (but not quite) regretted having shared the cupcakes. It was bursting with lemon flavor. Please Sprinkles, make this cupcake a year round flavor! What are your favorite Sprinkles Cupcakes flavors? You know ours, now we want to know yours! Leave a comment below or use the hash tag #GeekEats! We’d love to hear from you! Happy Independence Day! *The Geeks were given comped items to facilitate this write-up; We were provided information about the 4th of July Box promotion. All opinions are wholly our own. View our Disclosure Policy for more info.